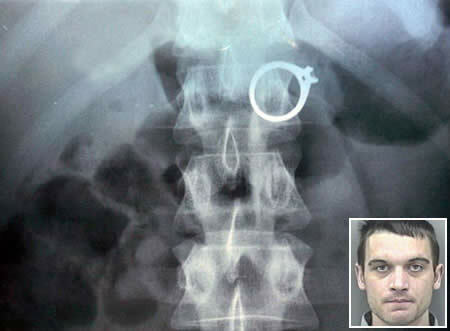 At the Nishtar hospital in Multan, Pakistan, surgeon Abdul Manan dsplays the X-ray of a glass bottle lodged in a man’s lower instestine. 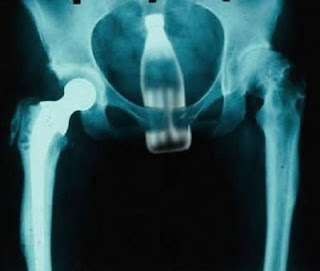 The man, who was 60 years old, reportedly required removal of the Pepsi bottle after armed thieves assaulted him with it before robbing him of his two buffalos. A rather unfortunate nailgun accident. 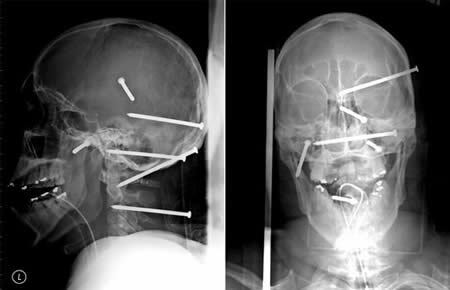 A Los Angeles construction worker had six nails driven into his head in an accident with a high-powered nail gun. 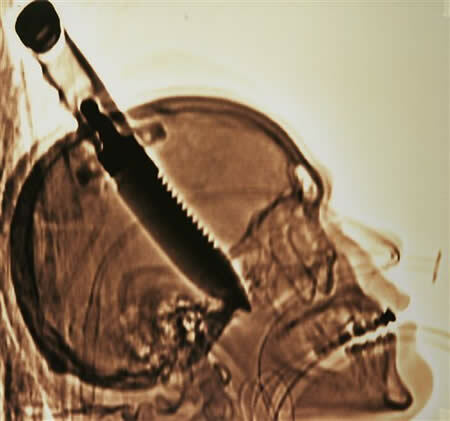 Michael Hill is notable for having survived being stabbed in the brain with a 20 cm (8 in) survival knife on April 25, 1998.The knife was the largest object ever removed from a human skull. While at a friend’s residence in Jacksonville, Florida, Hill answered the door and an unknown person stabbed him in the skull. He then walked down the street to another friend’s house. Hill’s arrival and treatment at the Shands Jacksonville Trauma center was documented and broadcast on the TLC series Trauma: Life in the E.R.. 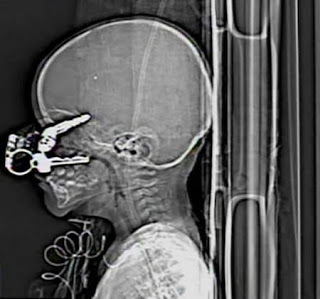 The X-ray with an eight inch knife sticking out of his skull is on display during the grand opening celebration of Ripley’s Believe It Or Not Odditorium Thursday, June 21, 2007 in New York’s Times Square. An X-ray shows the 6.7 inch pair of surgical scissors in the abdomen of 69-year-old Pat Skinner of Sydney, Australia on April 20. The woman had part of her colon removed at Sydney’s St. George Hospital in May 2001. But she said that she continued to suffer intense pain in her abdomen for months after the operation.Eventually, she demanded doctors x-ray her abdomen. They did and discovered the 6.7-inch pair of scissors, which were removed in October 2002. 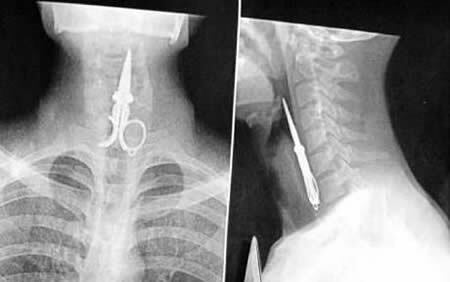 X-rays showed the 9cm long and 4cm wide scissors fully entered esophagus, with the sharp top angling up to the epiglottis. Chinese surgeons saved a man’s life after he accidentally swallowed a pair of nail scissors he was using to clean his teeth. 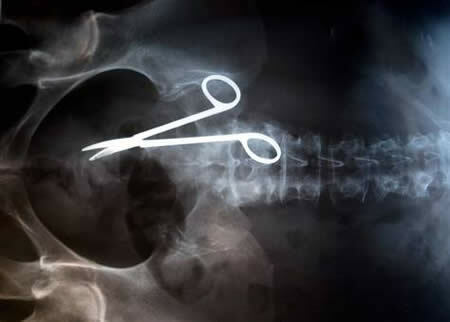 Lin Kong had borrowed a four-inch-long pair of nail scissors to use instead of a toothpick to clean his teeth after a meal.But as one of his friends told a joke, the 27-year-old laughed and swallowed the clippers. Surgeons in Rotterdam in the Netherlands were flabbergasted when X-rays showed 78 different items of cutlery in the 52-year-old woman’s stomach. 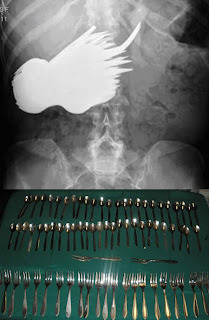 They rushed her to surgery in a desperate attempt to remove the dozens of forks and spoons trapped inside her body one by one. The astonishing images were actually taken over 30 years ago – but they were published for the first time this week in a Dutch medical magazine.She had been diagnosed as suffering from a borderline personality disorder that left her with an urge to eat forks and spoons. 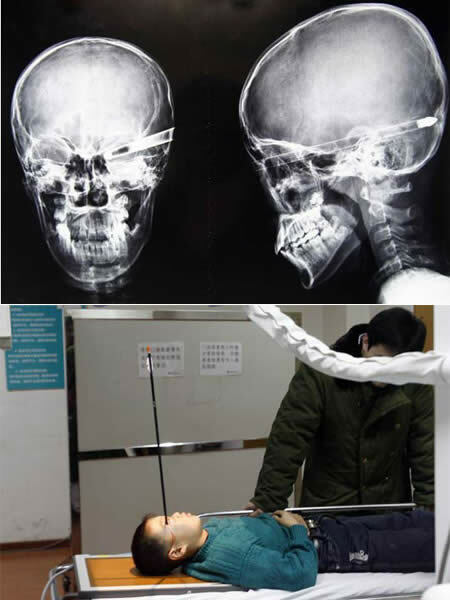 It went through 11-year-old Liu Cheong’s eye socket, completely through his head and was only stopped by the back of his skull. 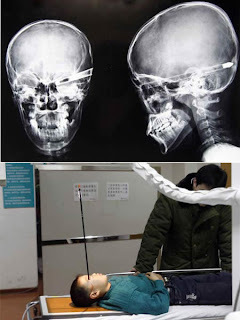 “If the arrow had been shot with just a bit more force, it would have come out the back of his head,” said doctors at Jida Hospital in Changchun, eastern China. After brain scans and x-rays, doctors began to cut away parts of his skull to remove the arrow without damaging optic nerves or brain tissue. The boy only survived because the arrow had miraculously missed his brain.